ROAD TO WMTBOC 2011: Beat Okle (Switzerland) still riding high. If during WMTBOC 2011 you see a man wearing a red shirt with a white cross, giving directions, advices and biking, no doubts - it's Beat Okle. Beside his job as team manager and coach for the the Swiss Team, he will compete, too. Aged 41, the 2008 long distance bronze medalist in Ostróda is still riding high. Switzerland is perhaps not so dominating in mtb-orienteering as it is in foot-O. "We have a lack of athletes who are willing to invest enough for international level" Okle says. But exceptions exist: the 4 times world champion Christine Schaffner will be in the team. She has participated in all seven World MTB Orienteering Championships from 2004 to 2010, and won gold medals in the long distance four times, in 2006, 2008, 2009 and 2010. The 32-year-old goldsmith from Köniz won the long course at the Swiss mountain bike orienteering championships seven years in a row from 2003. 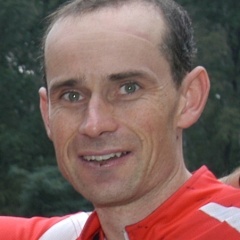 Not to mention Alain Berger, the first and the only orienteer to become twice Relay World Champion in foot-orienteering (1991 - Mariánské Lázně; 1995 - Detmold) and long distance World Champion in MTBO (2004 - Ballarat, Australia). Competing close to home is a big advantage for Switzerland. "Most of the team took part in the World Cup in Italy and in the training camp in Autumn 2010" Okle says. "We will hold selection races in May. Our goal is to get 2 medals, one of them in the Relay". Beat Okle is an Swiss mountain bike orienteer. He won a bronze medal in the long distance at the 2008 World MTB Orienteering Championships in Ostróda, and placed seventh in the middle distance and fourth with the Swiss relay team.